Although I have traveled all over the world in international first class, I had never tried out United’s first class longhaul product…until last week. 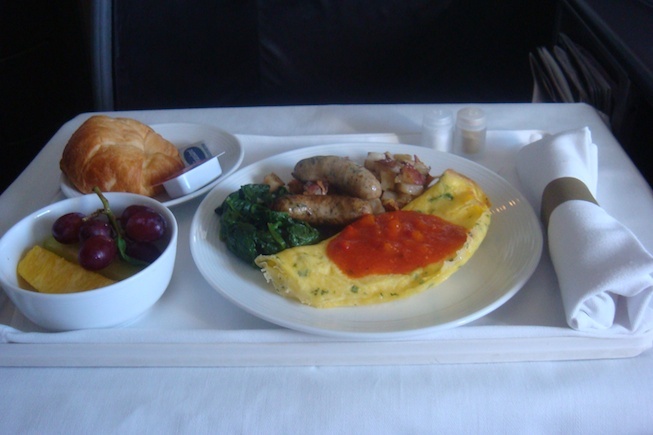 UA’s international first class service is often criticized, especially when compared to its competitors, but I was not convinced. On the contrary, my hopes were high for a great flight. Sadly, my expectations were misplaced. While the seat and food were great, the service was so unprofessional that I was unable to walk away from the flight with a good impression. Thanks to a freak afternoon storm at Dulles, boarding for the flight was delayed by 45 minutes. No problem–I just relaxed in the lounge. When it came time to board the 767-300 to Frankfurt, I made my way down to the jetway and boarded the aircraft where I found three male flight attendants engaged in a conversation. One mustered a nod, glanced at my boarding pass, and pointed toward the galley. Since UA’s first class cabins on international flights are often comprised of non-revs, maybe he thought I was just an employee. I settled into my suite, 1K, manufactured by BE Aerospace and extremely comfortable. In addition to being well-padded, it contained three compartments with ample room for storage. Unlike the seats in business class, which offer very little in the area of storage, I had more than enough storage space all around me for my second carry-on bag, wallet, phone, book, and laptop. A few minutes later a flight attendant came by and handed me a menu (an amenity kit was already sitting on the ledge to my right) and offered me a choice of beverage ("Do you want anything to drink?"). I ordered sparkling water but was brought back a (plastic) glass of sparkling wine. Moments later the purser strolled up and simply said, "Have you had a chance to look at the menu yet?" Keep in mind, we were still in the midst of boarding and I was just handed the menu a couple minutes ago. I asked him to give me a moment and he said "no problem" and walked away. A note on his appearance: his uniform was wrinkled and the top button of his shirt was open with his tie loosened. But the lack of professionalism did not only manifest itself in his unkempt appearance. He strolled back a few minutes later, again wanting to know if I was ready to order dinner. Even if I gave him the benefit of the doubt, an assumption that he rushed through meal orders because he knew the flight was only 8 hours and most would want to sleep as soon as possible after takeoff, that did not excuse the fact that he failed to welcome each passenger aboard or even introduce himself. And lest you think I am ragging on American work ethic, the purser was German. By now we were about an hour past scheduled departure time and I asked the purser what time we were due into Frankfurt. He fumbled around his pockets for the flight info sheet and eventually fished it out of his back pocket before promptly dropping it, picking it up, dropping it again, then commenting, "Shows how prepared I am for this flight." Indeed. Flight time was a short 7 hours, 22 minutes so I was hoping we would take off soon and I wouldn’t be into work too late the following morning. But that little storm at Dulles had moved up north–right in middle of our planned flight path. For some reason, the captain did not announce why we were just sitting at the gate–finally a FA had to go up, retrieve the information, then report it over the PA system. We ended up sitting on the tarmac for two hours. During that time, I could not even watch a movie because the APU kept shutting off, causing the IFE system to restart. Good thing I had a book with me. During the first 1.5 hours of the delay, the three FAs who were standing around the door when I entered the plane resumed their conversation, paying no attention to the passengers in first class. Meanwhile, business class was served warm nuts and offered a beverage. Finally one of the FAs realized that it might be a good idea to check on his passengers and came around the cabin with ramekins of nuts and took beverage orders (once again, not "may I offer you a drink?" but "want anything to drink?"). I wanted to test him and see if he knew what wine was onboard, so I asked what kind of red wine he had. Surprisingly, he knew that there were two varieties loaded and what kind they were. Impressive. I chose the 2007 Bordeaux and it was actually very good–the FA promptly refilled my glass before I even downed half a glass. Our takeoff slot opened up and we were finally on our way–not a moment too soon. Upon reaching 10K feet, the purser went to work assisting in business and economy class (as he should have) and the FA who had delivered my wine took care of the five passengers in the first class cabin. Although he was not as polished as many of UA’s FAs (no addressing passengers by name and he still annoyingly said things like "you’re welcome" and "do you want…") he was attentive during the meal service. I have been so negative thus far, but now let me say a few good things about UA’s first class product. I could not have been more comfortable during the ground delay–the seat is plush and comfortable no matter what position you are in. The large bi-fold tray table made eating quite easy in an upright or semi-reclined position. Dinner was tremendous. I am not a huge seafood fan, but the shrimp appetizer was wonderful. The jumbo shrimp were flavorful and the cocktail sauce was a nice accompaniment. 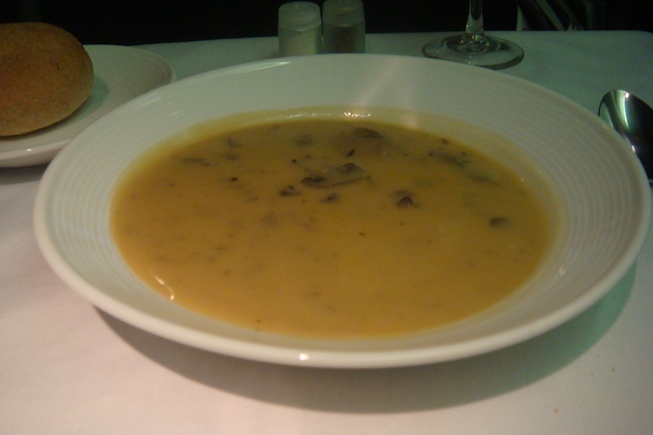 Next came soup, a bowl of cream mushroom soup that was piping hot and garnished with fresh-cracked pepper. A generous helping of green salad followed, served with a choice of Caesar or sesame vinaigrette dressing and large croutons. 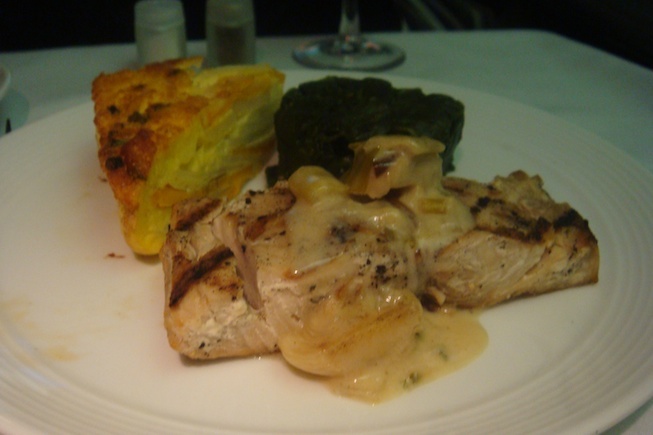 I chose mahi-mahi for the main course and although it looked a bit dry, it was delicious, as was the the potato accompaniment and vegetables. 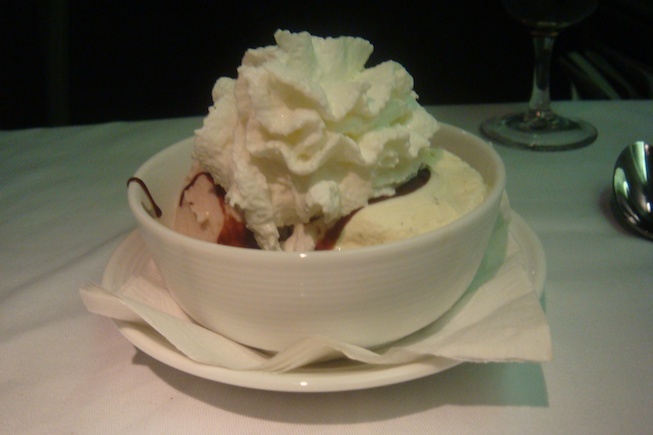 For years UA has served ice cream sundaes as dessert in international first class and that is just the way I like it: simple and delicious. I turned down the fruit and cheese plate and readied myself for bed. There was still time for nearly six hours of sleep before breakfast. I slept soundly and awoke over France, about 50 minutes prior to landing. The same FA soon noticed that I was awake and offered me breakfast–a herb omelet with potatoes, sausage, and spinach, served with fresh fruit and a croissant. A typical UA breakfast, but a good one. The salsa on top of the eggs seemed to make all the difference. I will nitpick that the butter was not served in a small dish and jam was not served in a bottle. My tray was collected and it was off to lavatory to freshen up before landing–I would need to head straight into the office. We landed about two hours behind schedule and taxied for quite a while before stopping at a remote stand. Two busses rolled up and stairs were rolled up to the aircraft. No word of thanks or even a goodbye from the FAs, but by this time my mind was focused on a meeting I had coming up in the next hour. United’s international first class product offers a refreshingly good choice of food and a great seat for sitting or sleeping, but the service aspect was extremely disheartening. While service in the air was good, the lackadaisical attitude of the purser and general lack of finesse displayed by any of the FAs is cause for concern. It costs nothing to be friendly and act with a little decorum and it is high time United took steps to insure that its best and brightest work in international first class. My favorite slogan bears repeating: it is the little things that make a difference. Hmmm after reading your first paragraph, i was prepared for worse! Sounds like the same UA we all know and (sorta) love: Awesome hard product, TERRIBLE soft product! To be honest, I prefer that to something like Thai: rough hard product (at least in C), great soft product. Since UA’s first class cabins on international flights are often comprised of non-revs, maybe he thought I was just an employee. You’re generally biased towards most things UA, so nice to see an unbiased critique on their weak service offering. Sadly this problem isn’t limited to just UA, but really all American carriers. This reminds me of auto manufacturing. Americans aren’t genetically unable to make quality cars (many “foreign” manufacturers produce cars here with American labor)…the issue lies with the training programs and levels of service that are deemed acceptable. Clearly, for what is typically a 5-digit plane ticket, a pax would reasonably expect a service experience different than what you experienced. a. do the FA’s know you are a non-rev or employee in First from their PAX list? curious. b. what happened to the inflight Continental culture influence? Let’s hope the new CEO will improve “training programs and levels of service that are deemed acceptable” very soon. I’m amazed they didn’t address you by name. When I flew on Thai Air in Jan., int’l bus. class, they addressed you by name from the boarding, during entire flight, & by telling you at the end how they appreciated your business. Virgin Atlantic & Asian carriers seem to have a totally different work ethic, compared to Amer. carriers. Maybe, Amer. carrier FA’s take too much prozac. It’s sad, but you can get better and more personal service at a Chic-Fil-A than you get on United First class. At least at Chic-Fil-A they reply to your “Thank You” with “My Pleasure” every time. Ok, I get the issues with “do you want” instead of “may i offer” – but since when did “you’re welcome” become annoying? Obviously “my pleasure” is better, but “you’re welcome” – at least in my opinion – never went out of style. It’s better than saying nothing at all, that’s for sure. I hope you filled out the after travel survey. Smisek acknowledges the need for United to improve the soft service, especially internationally, so every bit of info helps. International F on United is downright depressing. I’ve done SYD back & forth a few times that way, and I regret ever using miles for the experience. Never again. @Darren: I have not had the chance yet, but I intend to! In fact, I think I’ll do it now. @Jon: Fair point. I can nitpick. @Sean: LOL. It’s sad that UA is so inconsistent. @Ken 747-400: I don’t think the manifest specifies who the non-revs are, but they usually are quick to identify themselves. @NYBanker: I try hard not to be a UA apologist, but UA can and many times has exceeded my expectations (though as I mentioned, this was my first trip in int’l F). Sadly, UA remains consistently inconsistent. My experience may have been bad, but not this bad! After flying in F on the 747-400, which 2 seats would you recommend for a couple flying together? Im thinking either 1A/1K, 3C/3H, or 4H/4K. @David: Go with 1A and 1K. I love the front row nose of a 747! But if you want to be right next to your mate, your only choice is 3C/H. Just wondering. You didn’t like them say “you’re welcome”. What would you have preferred? “Your are welcome” or “My pleasure”? Either would be fine. I don’t like it when FA’s say “You’re Welcome” in a tone like they are doing me a favor, because they are not–they are doing their jobs. EXCELLENT trip report. Thorough, thoughtful, balanced. As for non-revs on the manifest, at our former airline the FAs can tell that info from the manifest list. That’s how they’re able to know who’s who, their elite status, etc. Good job! The boy in the suit on an aeroplane in the drawing above, is that you? So cute! How old are you? With the exception of the weather delay (which is impossible to avoid) and a few things the ariter felt were less than satisfactory (“you’re welcome” is no longer acceptable? How about anything you say your highness)…the trip and service appears to be just fine. Especially considering he didn’t pay for the flight out of his own pocket. I don’t know, I agree with most – you’re being overley nitpicky, and not focusing on what actually generates demand and sale of this product both to the target ddemographic which is frankly top tier elites and travel managers. GS/1K have been used to and in some cases expect 3 cabin first class cabins for.decades at UA . In 1999 that F cabin was the only way to lie flat on a US carrier, and remained so for years. corporate travel managers, balance a great hard product on an all inclusive airline which happens to have the worlds largest route network. Point is, UA F is the right product (plus or minus depending on crew) for its price and award/upgrade availability. When considering this then we know why comparing to other one hub/city state foreign entities is a fruitless exercise. And rest assured next to the constant deriders/Co chest pumpers that UA F is pathetic and is a disaster and should be removed – UA’s route network fully supports F. It’s elites like F. UA likes the $$. And yes, it is frankly a defining incentive and distinction in the UA employee benefits package; they lost domestic F to UDU – an embargo of intl. F would be a nonstarter from every side of the workforce who would wage enormous blowback. If still in doubt, consider UA spend hundreds of millions on upgrading the entire 90+ intl. widebody fleet with a product that included an F rehaul, even for the 763, hrm.. I just don’t understand how you can defend such lackluster service. I’ve been a 1K for five years, am very loyal to UA, and have flown all around with them. But I have also flown around the world on the likes of Asiana, Thai, Lufthansa, Swiss, and Cathay Pacific as well. Why is it that UA’s service is so tragically bad when compared to the others? This is not about saying “you’re welcome” rather than “my pleasure”, it is about my interaction with the purser described above and what a horrible tone it set for the flight. Sorry for the long comment, but My wife and I just returned from a vacation which we flew 1st class on United (IAD-FCO), Thai (FCO-BKK), & Asiana (ICN-ORD)& Thai Business Class (BKK-FUK) on saver award fares and here our thoughts on the service. 1. Asiana – Hands down the best of the three airlines. This is the 2nd time I have flown Asiana 1st class and their attention to detail and responsiveness is impressive in all areas. (I never once felt like we were treated differently because we were flying as a non-rev.) Also, great new seats/suites!! The Thai business class flight on a 2 configuration plane left at 1am. The service was poor. We were just suprised about the difference after having had such a pleasant experience on Thai 1st class. The seats were about 25% full, so it wasn’t a flight attendant to passenger issue. Maybe it was the fact we couldn’t use the 1st class lounge that started us off in a different mood. Food – 1. Asiana 2. United (yes United on the main course anyway). Extras – 1. Thai & a close 2nd to Asiana. Note – Rome’s airport is not heated, so don’t put your coat in your suitcase no matter your final destination (like Bangkok) if flying through FCO. Particularly if you have a 5 hour layover. It must have been 45-50 inside. Why is saying youre welcome annoying?